View a larger size over at my Flickr account. 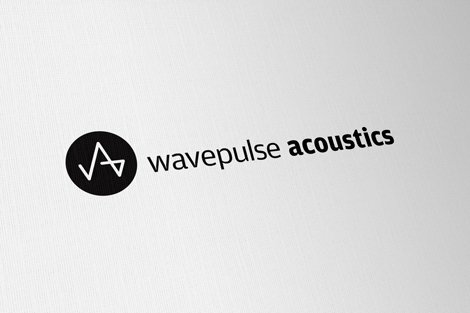 Read more on the development of this logo design – Logo Process – WavePulse Acoustics Identity Development. 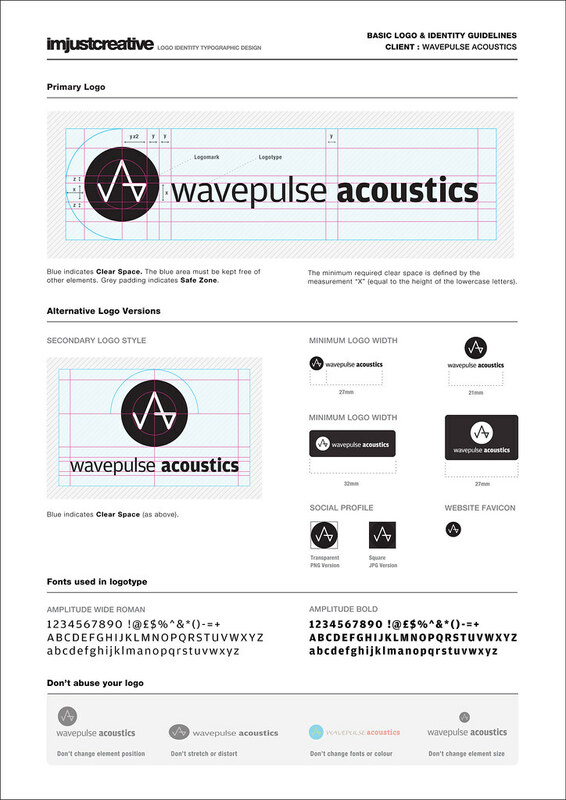 This is a single page A4 identity guide for the Wavepulse Acoustics logo. It’s purpose is to provide basic guidelines for the correct usage of the logo. As some projects are only providing logo designs, opposed to more complex brand identities, the amount of information needed is minimal. It’s not meant to confuse or overwhelm the client, hence it being a handy A4 PDF file. This guide covers the general construction of the logo, dimensions and proportions. Also includes the additional logo styles such as contained logos, portrait and landscape logos, social media profile images and website favicon. Information on the fonts used as well as a few handy ‘don’t do this with your logo’ examples at the foot of the guide. This is a neat way to also show the client, at a glance, the level of detail that goes into a logo, the spacing, the alignment, proportions etc. On initial glance, the logo may look simple with a word here and logomark there, there is fine level of detail to ensure the logo looks and feels right. It has been a challenge to try to fit all the information I wanted onto one page, without over crowding, whilst maintaining a clean layout design. This file was created in Illustrator opposed to InDesign. Not sure why, I just started fiddling in Illustrator and then I was too far done to start over. It did take some time, I was tweeting my progress whilst at various stages of the design. Finding the right amount of detail and laying it out so that is looks ‘OK’ was the challenge. Lots of tweaking, redoing, rehashing, coffee and undo’s. This was one page, I researched corporate identity guides with over 20 pages of guidelines, so these things are not quick. One reason why they cost so much to design. Now I have one file done, I can use this as a template for all my other projects, so time should be greatly reduced. I have done ad-hoc guides before, but I wanted to create a more branded look, something consistent with my own brand. I am now working on a 2 page guide and also a 4-6 page guide. The file will be saved as a PDF file and also a layered Illustrator EPS file. All elements except the various logo styles will be locked. This means the client can use this to pick up the various logos for their own use without having individual logo files floating around, should help to keep everything neat and tidy. Therefore, my aim is to provide each client with this ‘Dummies Guide to logo usage’ PDF guide. The majority of clients will get this A4 guide without question, this includes logo designs with a budget of more than £500. If the project or client requires a higher level of detail in the guide, they can pay extra for a more detailed book. I will be making a version of this identity guide available as a download, saved in Illustrator CS 4. Any other CS versions will be available on request. This means you can benefit from all my hard work and have a template to base your own guide from. Obviously try to inject some of your own style into it, rather than just using my design. But should be useful to get some of you off your feet in doing your own guides. Follow me on Twitter, Facebook and Google Buzz to make sure you don’t miss the announcement of when the download is available. Probably best sign up to this blogs RSS feed as well whilst you are at it. 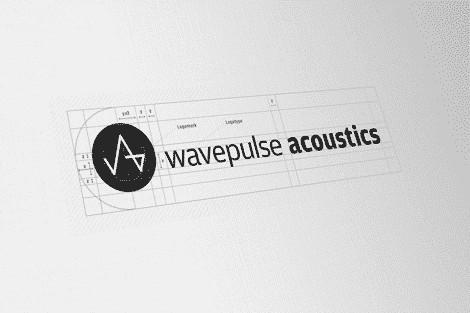 « Previous Post: A Viable Career as a Freelance Logo Designer?